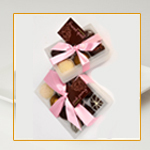 send holiday fudge from bonbon candies bainbridge island. we ship! Complete with a Holiday bow and gift tag!